When you’ve leapt from a horse onto the tail end of a plane that’s taking flight, fought an international bomb maker on sky-high scaffolding with impressive parkour skills, and corkscrewed a car over a broken bridge, you might just deserve to have your own day. Today is Global James Bond Day, marking the 53rd anniversary of the release of DR. NO in 1962. Since Sean Connery made his debut as the first cinema version of James Bond, five other Bonds have succeeded him in the iconic spy role. Spectre, to be released on November 6th , may be Daniel Craig’s last turn as Bond, and so far we know the plot involves a cryptic message from Bond’s past that leads him to uncover a sinister organization named SPECTRE. The movie’s trailers see Craig dashing as ever in his 00 work, charmingly clad in tailored suits and separates, many of which are Tom Ford (who, by the way, also designed a fair number of Craig’s suits in Quantum of Solace and Skyfall). Today we’ll take a look at three of our favorite outfits that we’ve glimpsed from the Bond trailers. We may not all be able to have Tom Ford as our personal suit maker, but we can definitely take some style cues from this eternally sharp spy. The O’Connor suit was specifically created by Tom Ford for Daniel Craig in his role as James Bond. The sharkskin version, which is seen in several clips from the trailers as well as on the movie poster above, features a jacket with straight shoulders and a single vent. It’s also closely fitted and is shorter in length. His trousers have narrow legs and are flat in front. Bond wears this suit with a white shirt with a point collar and a white handkerchief tucked in his breast pocket. A matching navy tie and sleek black Crockett & Jones derby shoes give this suit a classic Bond feel. For a more complete view of the suit, see the Bond movie poster above. The ivory dinner jacket is having a revival of sorts. Made popular in the ’70s thanks to John Travolta’s career-launching role in Saturday Night Fever, the ivory jacket is now being spotted on red carpets and now on modern-day Bond. Bond pairs the jacket with a black cummerbund, a crisp white Tom Ford dress shirt with a spread collar, and a black diamond batwing bow tie. Bond keeps the focus on the jacket with narrow black trousers. Bond wears a taupe jacket, tan trousers, and a crisp white shirt when he’s in Morocco. 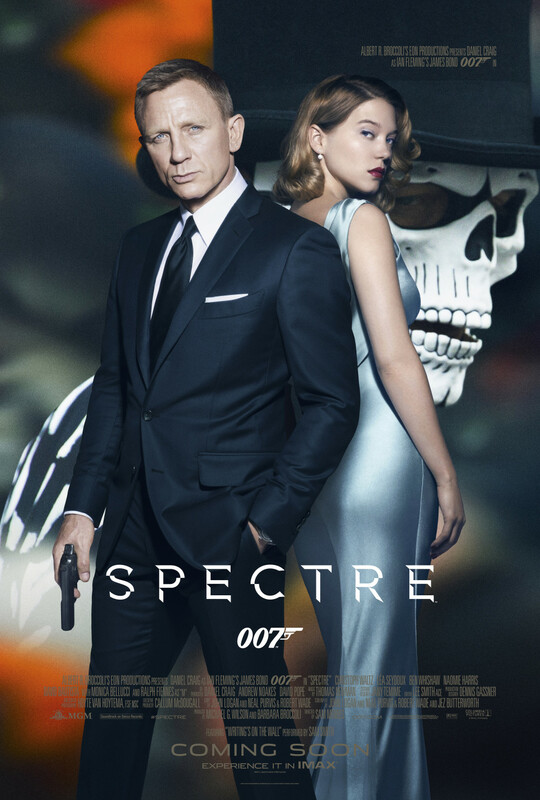 His jacket is cut shorter and the shoulders are more relaxed than the other suits he wears in Spectre. Though he wears a tie, its neutral brown color still keeps the look casual. 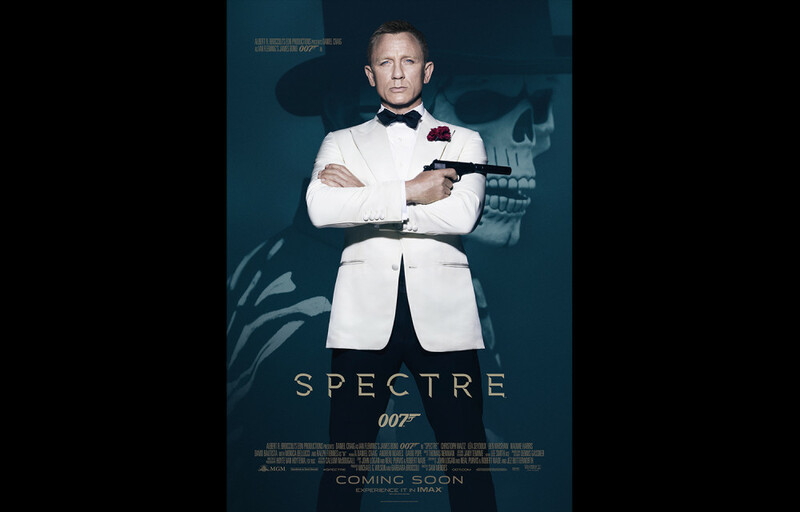 For more glimpses behind the scenes of the new Bond film, check out the latest trailer below.